I have been on a real green\energy saving\eco friendly push recently. Last winter my energy cost went through the roof and I want to ensure that my house is better prepared. I started by simply placing weather stripping on all of the exterior doors, all the obvious stuff, then I happened to see a device that may help me. 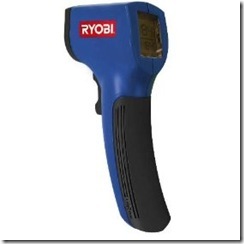 It is called the Ryobi IR001 non contact infrared thermometer, this hand held device shoots out a laser so you can accurately measure the temperature of very specific spots on your walls, windows, outlets, fireplace and vents. In fact this little device has already helped me eliminate two poorly insulated locations in my house and I am working on a third. If you want to do a comprehensive home energy audit (without the upfront cost) you can also sign up with Microsoft Hohm. You can see sample energy reports based on your area (where available) and see how your home stacks up. The initial questionnaire is kind of long but it is necessary to see what kind of home improvements you can do, and what improvements you may in fact need a professional to do.